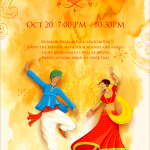 We are pleased to invite you with your family and friends to our first Garba event. Garba is a folk dance from Gujarat state which is now enjoyed all over India as well as in different parts of the world. Men and women dress up in traditional colorful dresses and come out together for 9 consecutive nights during Navratri days in Autumn to celebrate the victory of Goddess Durga over the demon Mahishasur. The tenth day is celebrated as Dussehra and Diwali follows after a few weeks. Garba folk dance is now adapted everywhere to celebrate communities and enjoy the harvest time and get into joyous spirits. Garba can be both fast and slow-paced dance performed in circles. Women traditionally wear colorful ‘ghaghra-choli’ and men wear the ‘Kediyu (shirt) and the Kafni. At times you might see a combination of both Garba and Dandiya (a dance performed with colorful sticks) during the Navratri days. Garba dance steps are simple to follow and any newcomer can quickly get into the rhythm after observing a few moves. One can also find many videos and tutorials on Garba on YouTube. Dance lessons prior to the start time. We hope to see you on October 20th!